309 Marlborough is located on the north side of Marlborough, between Fairfield and Gloucester, with 303 Marlborough to the east and 311 Marlborough to the west. 309 Marlborough was built in 1877-1878 by builder Daniel Weeks Beckler, one of four contiguous houses (309-311-313-315 Marlborough) built at the same time. Click here for an index to the deeds for 309 Marlborough. 309 Marlborough continued to be owned by Harvey Jewell and by the 1879-1880 winter season had been leased by lumber dealer Charles Fay Morse and his wife, Seraphine (Randall) Morse. They previously had lived at the Hotel Berwick (Columbus Avenue at Holyoke). In June of 1880, at the time of the 1880 US Census, the Morses were living elsewhere and 309 Marlborough was the home of Rev. Leighton Parks, Rector of Emmanuel Church, and his wife, Margarita Alden (Havens) Parks. 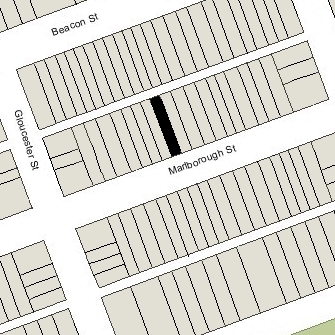 Earlier that year, they had lived briefly at 293 Marlborough, where they were listed in the 1880 Blue Book (they also were enumerated in 293 Marlborough in the 1880 Census, but the information is incorrect and probably was given by someone else). In 1879, they had lived at 159 Beacon. By the 1880-1881 season, Rev. and Mrs. Parks had moved to 100 Mt. Vernon and the Morses had resumed living at 309 Marlborough. They continued to live there during the 1881-1882 season, but moved thereafter to 377 Beacon. On June 29, 1882, 309 Marlborough was purchased from Susan (Bradley) Jewell by Thomas James Montgomery. He and his wife, Harriet L. (Johnson) Montgomery, lived at 38 Commonwealth. Thomas Montgomery was an early promoter of electric lighting, a distributor (from about 1878) of arc lighting systems manufactured by the Brush Electrical Company of Cleveland and also (from about 1882) also of incandescent systems manufactured by the English Swan Lamp Company at its Boston plant. In about 1884, the Brush Company purchased and closed the Swan manufacturing facility, moving all manufacturing to Cleveland. Thomas Montgomery’s distribution business ceased not long thereafter. 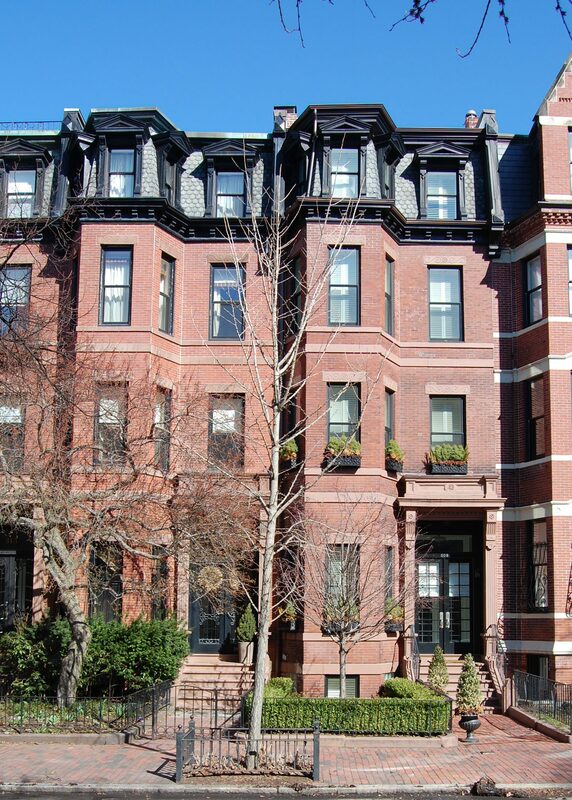 By the 1882-1883 winter season, 309 Marlborough was leased from Thomas Montgomery by Frank W. Freeborn, a teacher at Boston Latin School, and his wife, Margaret (Marguerite) J. (Hunter) Freeborn. They previously had lived at the Hotel Albemarle (Columus at Clarendon). They continued to live at 309 Marlborough during the 1885-1886 season, but moved thereafter and by 1888 were living at 38 Newbury. On October 30, 1884, Thomas Montgomery had mortgaged 309 Marlborough, 38 Commonwealth, and 77 Chestnut (which he also owned) to Charles F. Brush of the Brush Electrical Company. On April 4, 1885, Charles Brush obtained a court judgment against Thomas Montgomery, and on June 20, 1885, all three properties were sold by the sheriff at public auction to satisfy the judgment. Charles Brush was the successful bidder. On May 4, 1886, Thomas Montgomery transferred his residual interest in 309 Marlborough, 38 Commonwealth, and 77 Chestnut to attorney Lyman B. French, and on July 16, 1886, Charles Brush transferred his interest in 309 Marlborough to Lyman French. 309 Marlborough was not listed in the 1887 Blue Book. On April 22, 1887, 309 Marlborough was purchased from Lyman French by Dr. Henry Jackson, a physician. He married in October of 1887 to Lucy Rice, and 309 Marlborough was their first home together. 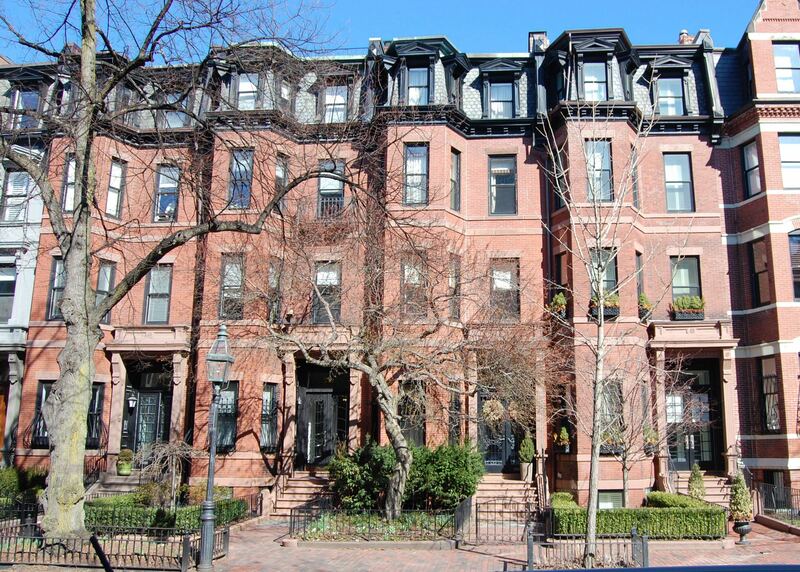 The Jacksons continued to live at 309 Marlborough in 1904, but had purchased and moved to 380 Marlborough by 1905. Henry Jackson continued to own 309 Marlborough, however, and lease it to others. By the 1904-1905 winter season, 309 Marlborough was the home of Dr. Fred Towsley Murphy, a physician, and his wife, Cornelia Brownell (Gould) Murphy. He also maintained his medical offices at the house. They had married in August of 1905, and 309 Marlborough probably was their first home together. Prior to their marriage, he had been a lodger at 292 Marlborough, where he had also maintained his office. Cornelia Murphy died in December of 1907. Fred Murphy continued to live at 309 Marlborough with their infant son, Charles Barney Gould Murphy. In 1910, Mrs. Murphy’s mother, Cornelia (Avery) Gould, widow of Charles Gould, was living with him. Dr. Murphy continued to live at 309 Marlborough during the 1910-1911 winter season, after which he moved to St. Louis. By the 1911-1912 winter season, 309 Marlborough was the home of Dr. George Gilbert Smith and his wife, Ruth Lenore (Davey) Smith. He was a physician and surgeon specializing in genito-urinary surgery, and maintained his medical offices at 309 Marlborough. They previously had lived (and he had maintained his offices) at 259 Beacon. They continued to live at 309 Marlborough in 1916. By 1917, they had moved to 36 West Cedar and he maintained his offices there and at the Hotel Hamilton at 99 Commonwealth (260 Clarendon). On May 24, 1917, 309 Marlborough was purchased from Henry Jackson by real estate dealer William J. Stober. One week later, it was acquired from him by real estate dealer James Sumner Draper. The house was not listed in the 1917 and 1918 Blue Books. On August 5, 1918, 309 Marlborough was acquired from J. Sumner Draper by attorney Alonzo R. Weed, and on August 18. 1918, it was acquired from him by Mrs. Julia E. (Folsom) Barrell, the former wife of Dr. Charles Sewall Barrell. The Barrells had separated in 1916 and she previously had lived in an apartment at 308 Commonwealth. Prior to their separation, they had lived at 425 Beacon (where Dr. Barrell continued to live). Julia Barrell’s purchase of 309 Marlborough was not recorded until May 3, 1922, and Alonzo Weed remained the assessed owner through 1922. In about 1924, Julia Barrell married again, to Augustus Franklin Goodwin. They lived at 309 Marlborough after their marriage. He previously had lived at the Hotel Puritan at 390 Commonwealth, and at 130 Commonwealth in 1914, prior to his divorce from his first wife, Frances (Thorley) Goodwin. Augustus Goodwin was a grocery merchant; the early 1920s he was president of The Ginter Company, and by 1927 he was Chairman of the Board of First National Stores. The Goodwins also maintained a home in Hamilton, which had become their primary residence by 1927. 309 Marlborough was not listed in the 1927 Blue Book. By the 1927-1928 winter season, 309 Marlborough was the home of Henry Lee and his wife, Frances (LeMoyne) Stevenson Lee. They also maintained a home at Beverly Farms. 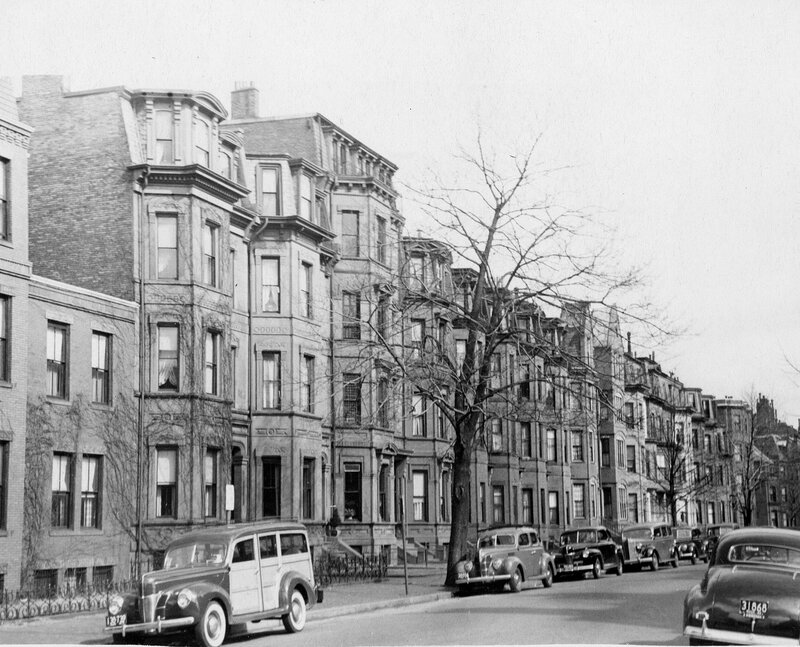 They continued to live at 309 Marlborough during the 1928-1929 season, but had moved to Brookline by 1930. 309 Marlborough was not listed in the 1930 Blue Book, nor does it appear to have been enumerated in the 1930 US Census. On June 23, 1930, 309 Marlborough was acquired from Julia Goodwin by Constance Richmond (Vaillant) Tenney, the wife of Dr. Benjamin Tenney, Jr., an obstetrician. They had married in June of 1929, and at the time of the 1930 US Census, they had lived at 108 Charles Street. Prior to their marriage, he had lived at 308 Marlborough with his parents, Benjamin and Alice (Parker) Tenney. They continued to live at 309 Marlborough until about 1941. By 1942, 309 Marlborough was the home of Theodore Mitchell Hastings, a retired architect, and his wife, Evelyn (Foster) Gardiner Hastings. They previously had lived in an apartment at 192 Commonwealth. They also maintained a home, The Box, at Contoocook, New Hampshire. They continued to live at 309 Marlborough until about 1945. On October 11, 1944, 309 Marlborough was acquired from Constance Tenney by Frank Perez. On April 10, 1946, it was acquired from Frank Perez by David Goldfine, an accountan. And on November 29, 1946, it was acquired from David Goldfine by Burton A. Bromfield. 309 Marlborough was shown as vacant in the 1946 and 1947 City Directories. On September 10, 1947, 309 Marlborough acquired from Burton Bromfield by George M. Bagan, a teacher, who converted it into a multiple dwelling, either apartments or a lodging house, and lived in one of the units. He previously had lived at 276 Commonwealth. In July of 1952, he filed for (and subsequently received) permission to do some minor interior remodeling. At that time, the property was indicated as being a four-family dwelling. He continued to live at 309 Marlborough until about 1958. On May 7, 1958, 309 Marlborough was acquired from George Bagan by Robert Louis Tucker, a widower. He lived in one of the units. He previously had lived at the Hotel Victoria at 273 Dartmouth. On January 18, 1965, he transferred the property to himself as trustee of the Tucker Real Estate Trust. He continued to live at 309 Marlborough until about 1971. On November 12, 1971, 309 Marlborough was acquired from Robert Tucker by Leland B. McDonough, trustee of the Tollingate Realty Trust. On October 29, 1974, 309 Marlborough was purchased from Leland McDonough by George B. Wenckebach. In April of 1987, he filed for (and subsequently received) permission to legalize the occupancy as four units and a dentist’s office, which he indicated was the existing use. On July 2, 2003, he transferred the property to himself as trustee of the George B. Wenckebach Realty Trust. On September 16. 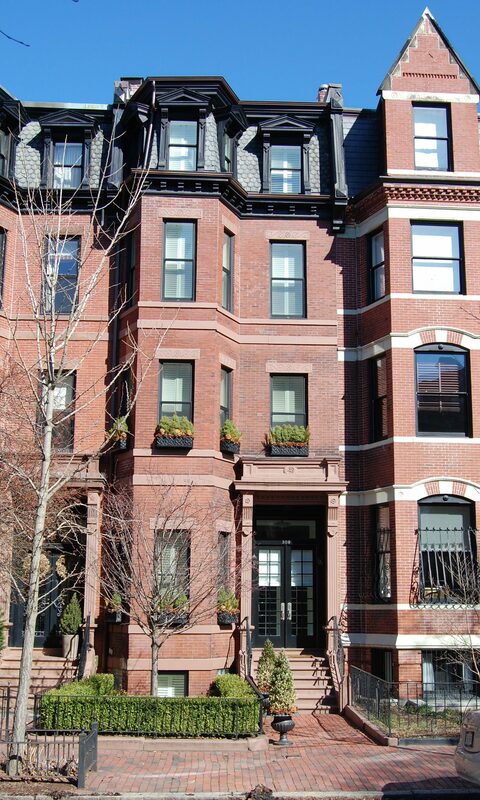 2011, 309 Marlborough was purchased from George Wenckebach by the 309 Marlborough Street LLC (Koby Kempel, manager of record). In October of 2012, it filed for (and subsequently received) permission to convert the property back into a single-family dwelling. The property subsequently changed hands. It remained a single-family dwelling in 2015.